Existing teams from a previous season can be moved into a competition in the current season. 1. 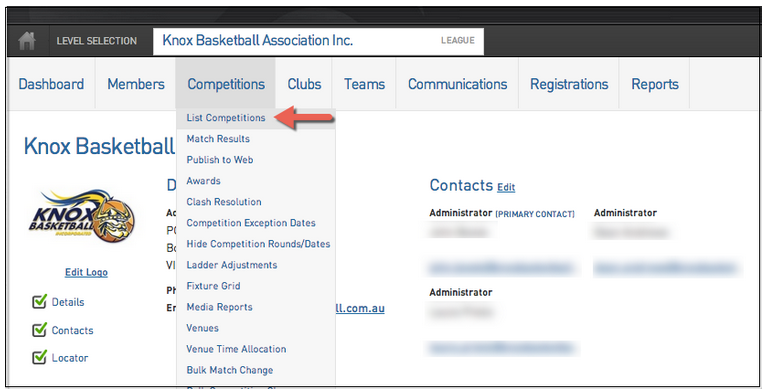 From the association level of the database, hover over Competitions in the top menu and click List Competitions. 2. The list of competitions in the association will appear. 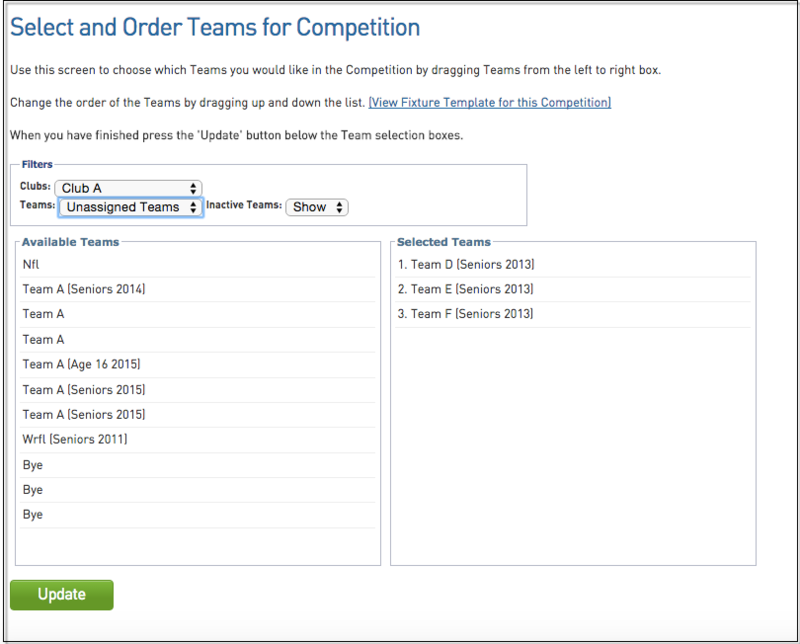 Locate the competition you wish to assign teams to and open it by clicking on the view button next to the competition name. 3. The competition's 'dashboard' will open. Click on Teams in the menu. 4. The list of teams participating in the competition will appear. 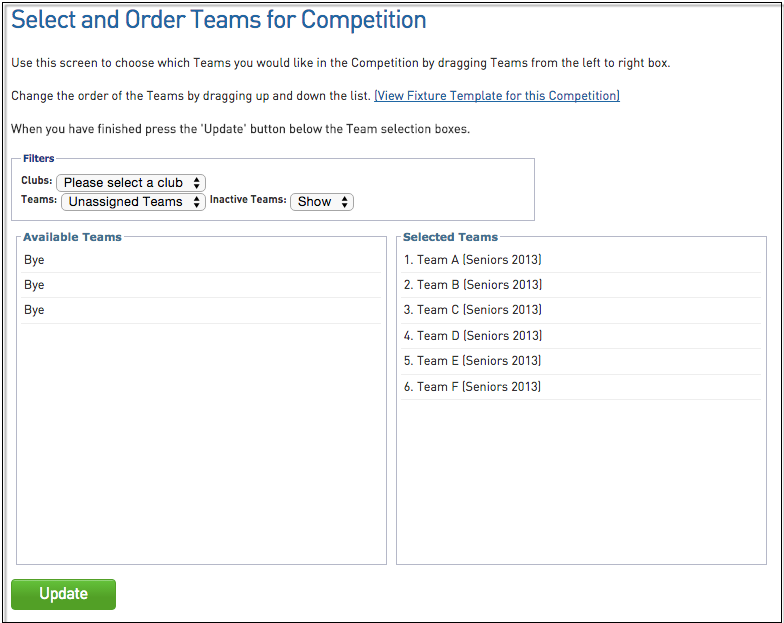 Click on Manage Teams in Competition. 5. A screen will appear that allows you to select teams to participate in the competition. The list on the left hand side shows the 'Available' teams according to the filters selected. On the right hand side is a list of the 'Selected' teams - the teams that have been assigned to the competition based on the filters selected. If you have not yet assigned any teams into the competition, this list will be empty. 6. After selecting your desired filters, the 'Available Teams' list will be updated accordingly. To move a team into the competition, click on the team name from the Available Teams list and drag and drop it into the Selected Teams list. You can position the team anywhere in the list so that it is allocated a certain 'team number' which is then applied to the fixture template used to generate the fixture. The team is now in the competition. 7. Select the next club from the 'Clubs' filter that you want to move a team across from. 8. The Available teams list will be updated to show teams from that club. Drag and drop the desired team from this club into the Selected Teams list. 9. Continue this process until all of the required teams have been added to the competition. 10. Click on Update to save the teams selected for the competition.